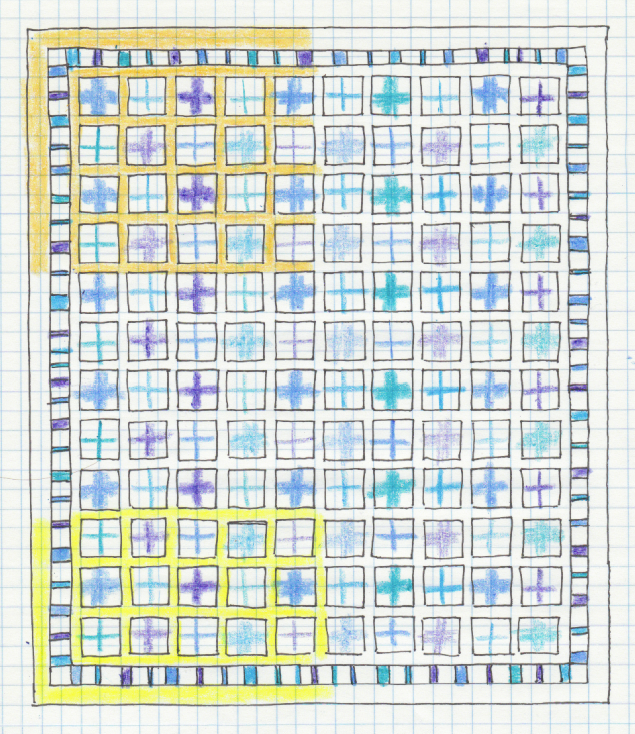 I figured out that if I wanted to make a quilt roughly twin sized, I’d need to make 80 blocks. Well, I thought — I’m well on my way! Look, I have 64 of them done! All right, so it doesn’t look very impressive in those little bitty stacks. But that’s still 64 6.5″ square crosses right there! 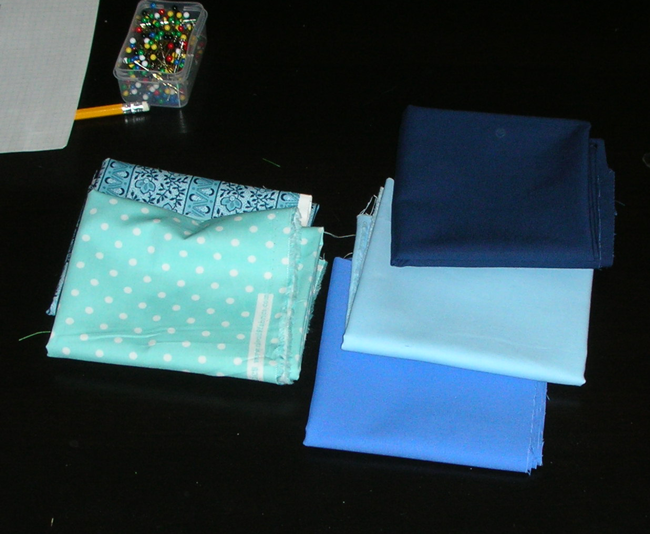 And I only have two more colors to go, to get this all cut and sewn, see? Here’s my logic in putting this diagram together. I’m putting 2″ strips between the blocks, so that works out to 1.5″ of sashing on each side of a block (assume 1/4″ seams). 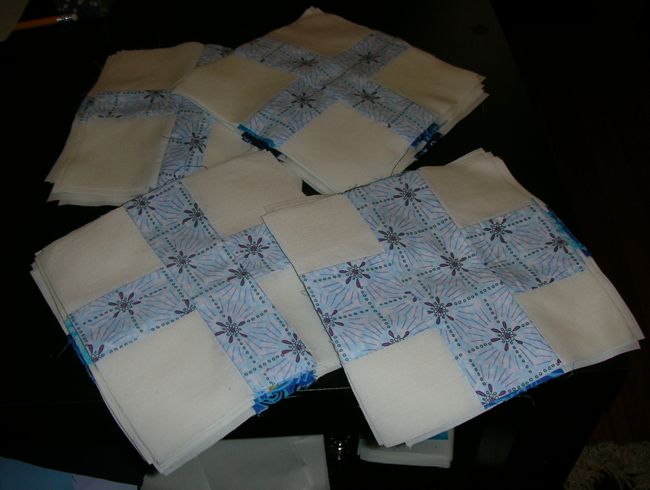 The blocks are squared to 6.5″, so they will be 6″ square, if I put them together properly. This means I can increase this pattern by increments of 7.5″ (6″ block + 1.5″ sashing) So I did that, and increased it in size to 10 x 12 rows of blocks. You’ll notice one other difference from the pattern as written: I decided to add a striped border using the scraps from the fat quarter fabrics. 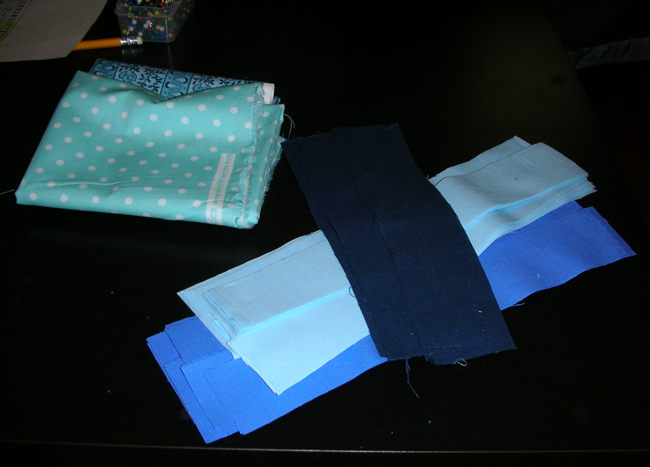 It will be 3″ wide, striping blues and the white background fabric. The white stripes will always be 3″ square, but the blues will vary in width from 1 1/2″ to 2 1/2″, in the same increments as the crosses. I’m looking forward to piecing that part together, though I suspect I’m going to hate it just a little bit when I’m putting it together. That striped border adds 3″ to each side of the quilt, for a total of 6″. But then I wanted to be sure I had plenty of material around the edge of the quilt to trim and still have enough room to sew on the binding without it obscuring the stripes. So I added in a 3″ strip of sashing around the outside of my impromptu striped border, which adds another 6″ to the final dimensions. I’m a little daunted by the idea of quilting all of that, but I’m pretty sure I know how I’m going to do it, so that part, at least, is a little less scary. The solids are Kona cotton, the prints are whatever happened to be in the fat quarter bin and caught my eye. 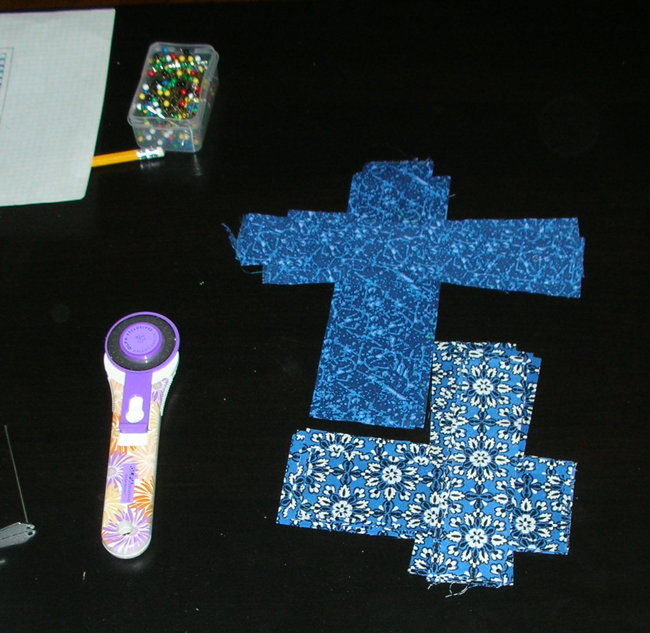 I’ve cut three of them so far, but then the draft deadline for the paper that will become my thesis called, and I’ve paused right now, about to cut out the stripes from the last two fat quarters, and then cut 40 more 6″x6″ white blocks for the backgrounds of all those new crosses. I’m just glad I have a few extra yards of this white background fabric: otherwise I would be very, very sad.